Using the card game Snap! with younger learners of EFL/ESL is certainly not an original idea – if you search the web you’ll find lots of different versions. It’s a game which can get a bit chaotic though, with arguments breaking out over who said Snap! first. In this version I’ve tried to take the chaos out by saying that only the person who lays down the matching card has the right to call Snap! 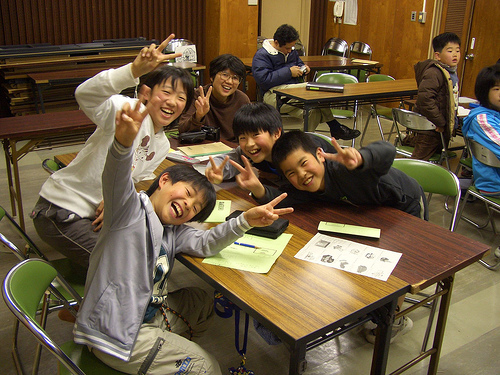 The game aims to consolidate a small amount of already known vocabulary. Choose ten pictures (1) showing objects or actions which students have met before but which you wish to consolidate. For example, if you have presented a specific lexical field (animals, toys, food etc) the lesson before, choose pictures of those things. Or if you think pupils are forgetting lexis taught earlier in the course, choose a random set of those things. The pictures should fit on a card about 5 x 6 cms. For each group of six students, make six photocopies of each picture, cut them out and stick them on stiff card. Laminate them if possible. Show the class each of the ten cards in turn and check that they remember the names. Write them on the board if necessary. Divide the pupils into groups of five or six, and give one pack of cards to each group. The cards (well-shuffled) are dealt out to the players who place them face down on the table in front of them. In turn, each pupil turns over their top card and places it on the centre pile, saying the name (a bear, a horse etc) or sentence (He’s watching TV) at the same time. If the picture is the same as the preceding card, the child also says Snap! and takes all the cards, which they place at the bottom of their pile. Each child drops out of the game when they have finished all their cards, and the winner is the last child left in the game. If you want the game to go on for a while, the early losers can form another group and start again. This keeps everyone occupied. 1. Lots of sites offer downloadable flashcards, but those available on MES-English are excellent for Snap! Photo provided under Creative Commons Licence by Genki David via flickr.